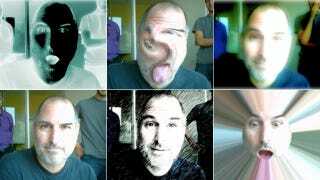 Here's an amazing series of pictures of Steve Jobs playing around with OS X's Photo Booth back in 2005. They're absolutely lovely, showing off a side of Jobs that so few of us knew. Good to see, on a day like this.